A moment of stolen reflection during last summer’s trip to France. The French value beauty in everything they do and build; it is an integral part of their culture and history, which makes visiting the country a dream and such an inspiration for an artist. I love the preserved old world architecture, the attention to detail and artistry everywhere I looked. Where are your favorite spots to travel to for inspiration? 2014 was a great year! It’s a blessing to be healthy, happy, and lucky enough to be doing the thing you love to do. This year saw a lot of changes, all good. Since last January 1, here are a few of the professional highlights. Last January I was still working on my MFA. It was a great time full of challenges and pressure, and totally worth the time and effort put in. The community spirit within the school was fantastic, with people really helping each other and creativity of the artists feeding off each other. I was attempting to paint the biggest painting I had ever attempted, and feeling overwhelmed. At one point I even painted a flat green over the whole tree. The next day, I panicked after seeing it in the light of day and realized how awful my experiment looked! I scrubbed the paint off, and the result was a much more cohesive, integrated look to the foliage and the leaves. Turns out mistakes can be valuable things. Here is the sketch that got the mammoth painting started, and a few shots to completion. First concept sketch for “Attainment”. 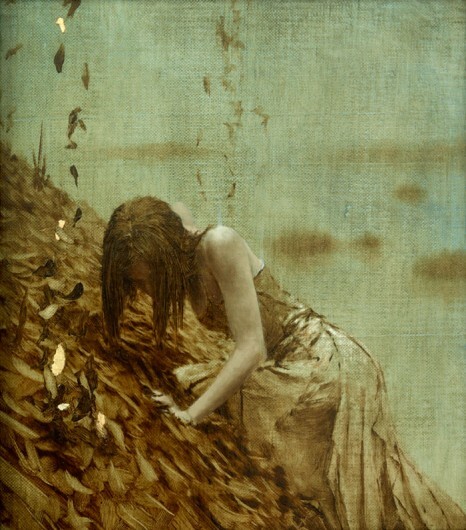 Attainment, oil, 23 karat gold and silver leaf on panel, 4 ft. by 6 ft.
Much of my time from January to May was spent making paintings for the Annual Student Exhibition at Pennsylvania Academy of the Fine Arts, were I graduated with my Master’s of Fine Arts, a dream I had for a long time, finally realized! I got everything I had been looking for out of the experience, the most important thing being the discovery of the beginning of a consistent voice in my work. Below, some of the work made during that time. At the Annual Student Exhibition–so excited to be graduating! I was also able to dabble in video production with the help of a friend. The actress in the film had access to some beautiful costumes from being in theatre, which explains the stunning costuming. The result is a video piece called “The Rending,” which you can see by clicking below. During 2014, I began a website dedicated to interviewing and learning from contemporary artists, called Eyelevel Arts. I was able to meet and interview many fascinating and wonderful artists. You can check out their interviews by following the link to www.eyelevelarts.com. Immediately following graduation, a classmate invited me to participate in the Rittenhouse Square Art Fair in Philadelphia. With the help of family and friends, I was able to exhibit there, and had a great time meeting collectors in the beautiful Spring weather. I was also able to visit Prague in the Czech Republic with several friends during the hot summer months. It was a great and eye opening trip filled with beauty, culture, history, and community service. My favorite part of the trip was hiking for the entire day along the border of Germany, through enchanted woods and fir forests, up to a natural stone formation. When you reached the top, you could see for hundreds of miles in ever direction. During the summer after the visit to Prague, I was lucky enough to be selected to be in Bridgette Mayer Gallery’s Ballet X Exhibition. The selected artists were given a 10″x10″ panel to work with. The piece I made was oil, butterfly wings, and 23 karat gold leaf, called “Holding Court.” It was inspired by the court of Queen Titania in A Midsummer Night’s Dream. Holding Court, oil, butterfly wings, and 23 karat gold leaf on panel. 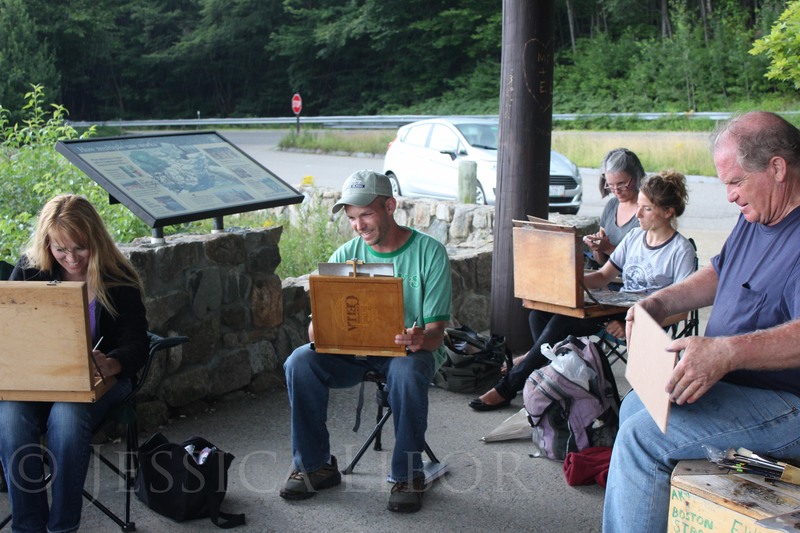 Also during the summer, I continued to paint and create, enjoying some plein air sessions with artist friends. In the fall, I moved with the help of friends and family to a beautiful new living space which doubles as my studio. I fell in love with the high ceilings and huge windows which let in lovely light. In October, I was part of a two person exhibition (with artist Alan Soffer) at the Bazemore Gallery in Philadelphia, PA. It was such an honor to be selected for this exhibition, and so heartwarming to see the friends and family that came out for the event. 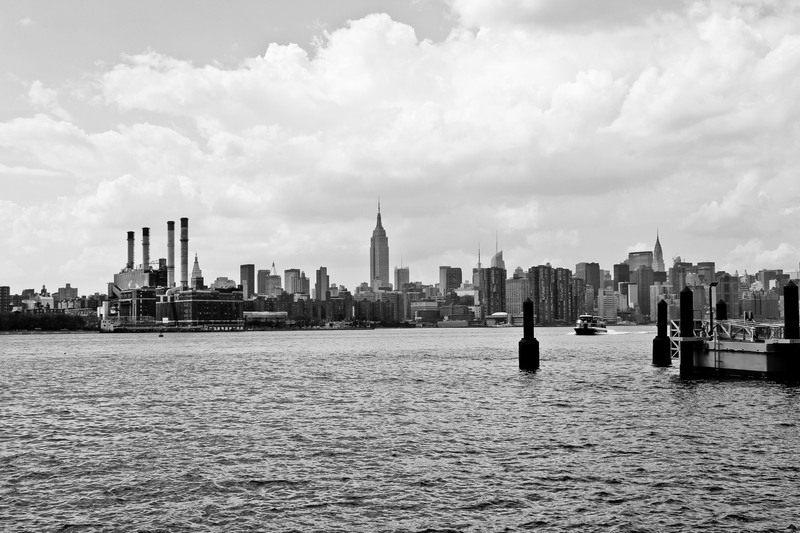 Visiting New York City for several friend’s and colleague’s art shows was also a high note. Especially inspiring was Judith Schaecter’s show in Chelsea. It was wonderful to see the gorgeous work of one of my favorite professors from PAFA have her work on display in such a prestigious space. 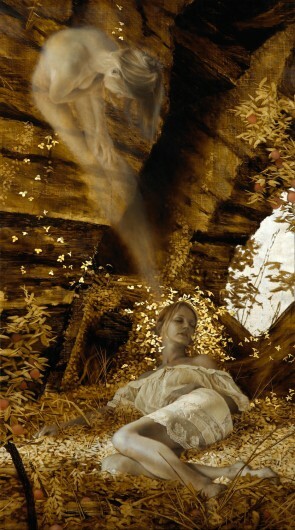 Also beautiful was Brad Kunkle’s December show. It was really cool to see his mix of traditional and new media as he overlaid intricate oil paintings with video installations. I’ve also been creating during the fall and winter months. A few of the pieces I’ve been working on are below. I also started selling my work online to collectors, which really opens things up and makes my work more accessible. 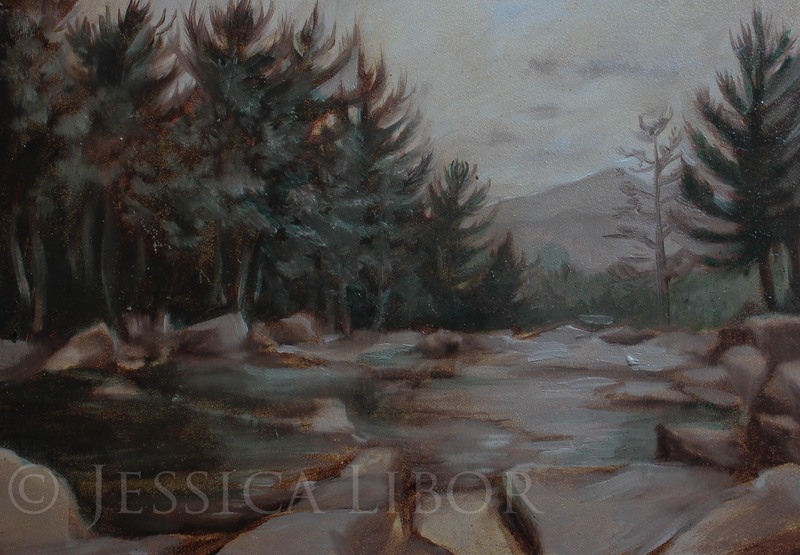 You can see my shop through my website, http://www.jessicalibor.com/shop/. 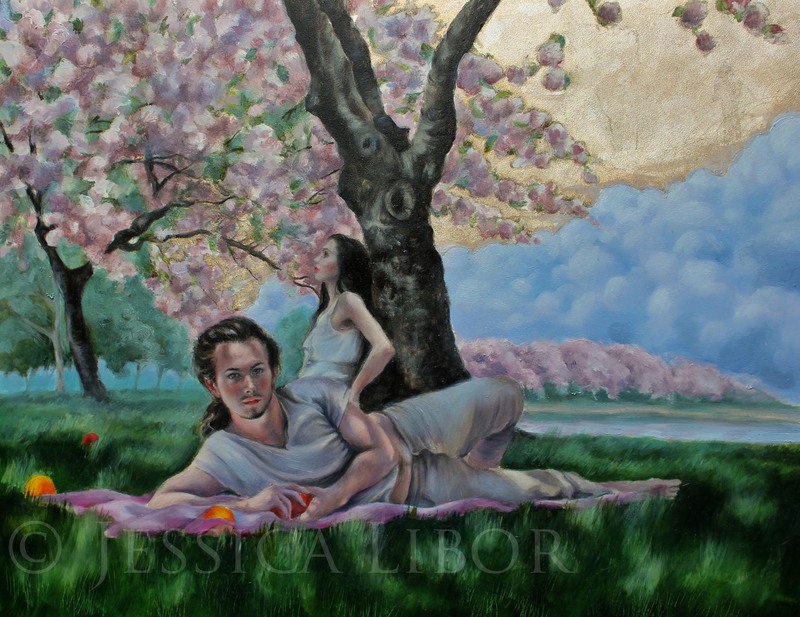 There are originals, and also limited edition prints, hand signed and numbered. I ended 2014 and started 2015 by celebrating with family and friends, making new memories with the people I love. Thank you to each one of you who have been a part of my year in 2014, whether a friend, professor, colleague, family member, or collector. I value each one of your investment into my life and my art. Don’t forget to sign up to receive each post by subscribing to this blog if you’d like to stay informed as to new works and shows. Thank you again for your support, and wishing each one of you a very happy, healthy and creative new year! This summer was an exciting one, full of lots of learning and traveling. Since my first year of my Master’s in Fine Art finished in May, I’ve been working in my studio at home a lot, sketching out ideas in my sketchpad, and planning out pieces. 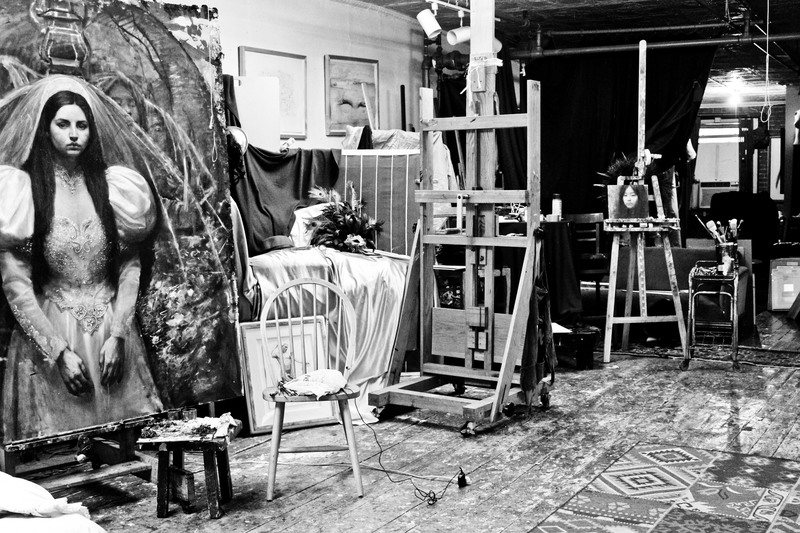 One of the highlights was visiting Steven Assael’s studio. I originally visited to purchase a piece—a small, elegant sketch of a reclining woman, looking behind her. 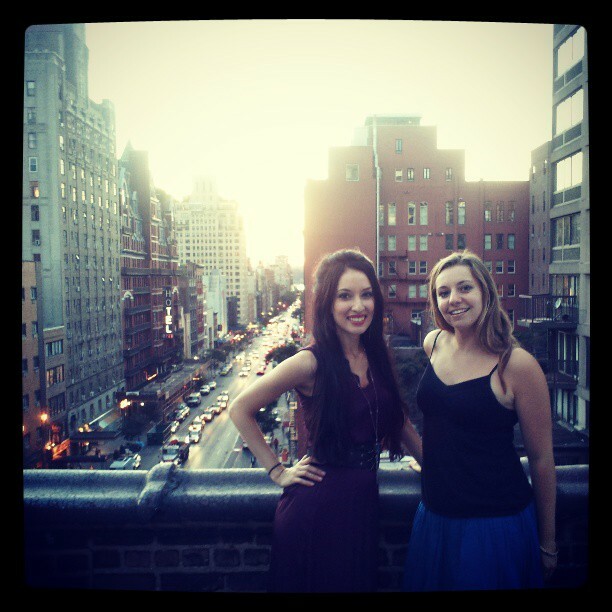 My friend Holly and I visited. 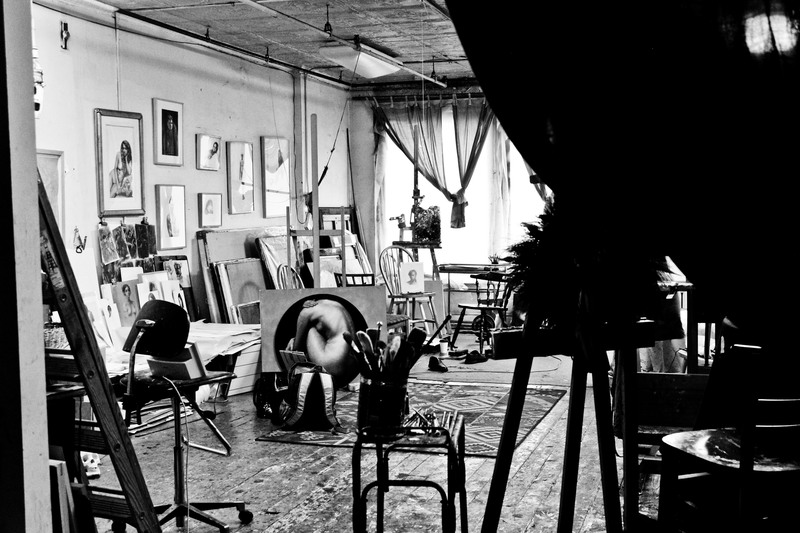 It was a treat to see the inside of his Manhattan studio—a studio draped in heavy cloths and curtains like a theatre, with racks of antique costumes, masks and props hung over mannequins. Dozens and dozens of highly finished drawings, more beautiful than real life, filled up the walls. Mr. Assael ended up doing a quick sketch of me as I was there, as well. I was amazed at how quickly he could capture a likeness. He was kind enough to give us advice as aspiring artists, as well. Being in New York City for a bit was inspiring. The hum and energy of the city always fills me with new energy, and I return home with a higher standard to hold myself to. 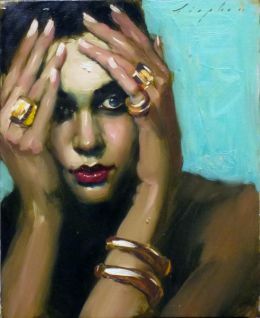 One of the trips there included a show at Arcadia in Soho—Malcolm T. Liepke’s solo exhibition. 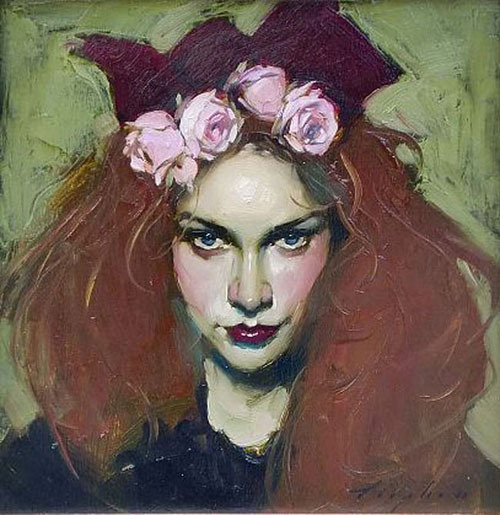 What I like about Liepke’s work is the consistency. Also, the way he uses color in the clothing, eyes, and hands of the figures is extremely pleasing to the eye. 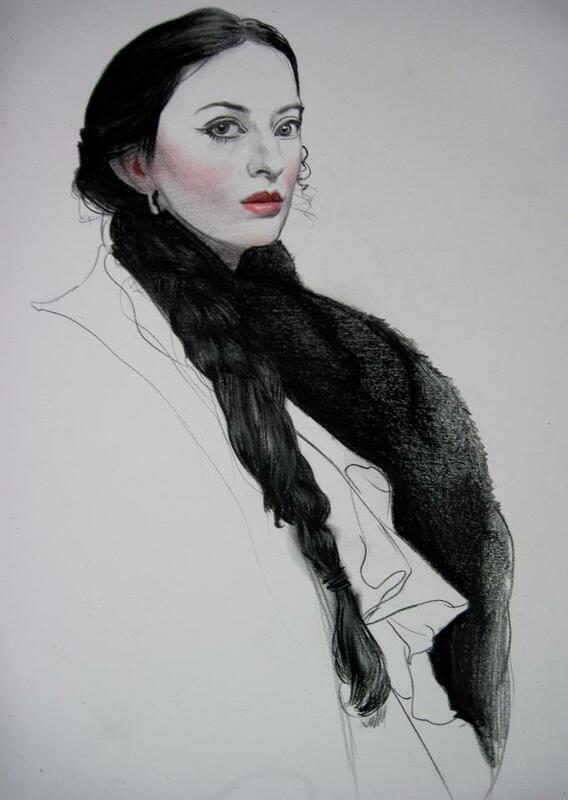 Loving fashion, I enjoy his interplay of high fashion and art. As always at Arcadia, the show was well attended, the gallery staff friendly and knowledgeable, and the show had substance and talent that was worth the trip. An exciting day trip this spring was a trip to Washington, DC to the National Gallery of Art to see the show “Pre-Raphaelites: Victorian Art and Design, 1848—1900”. 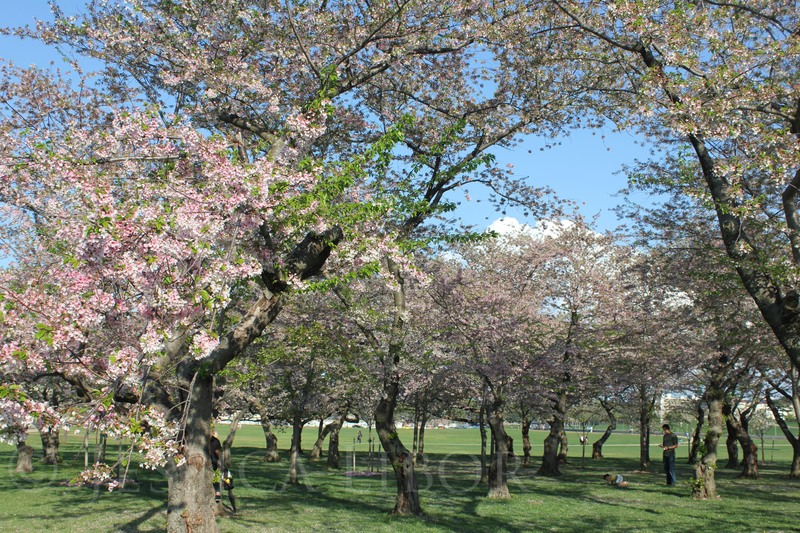 I arrived there just in time for to see the cherry blossoms in bloom! 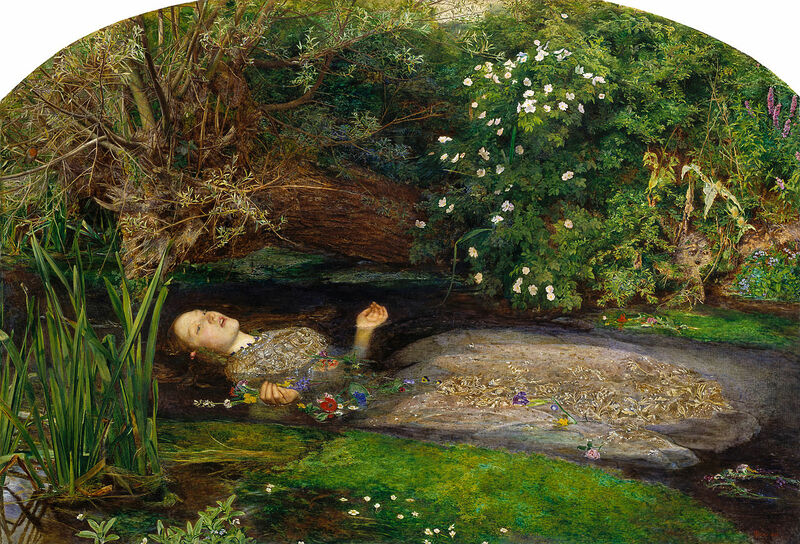 I’ve always loved the Pre-Raphaelites, but after studying in depth their history and personal lives this past year, I was ready to see their pieces in the flesh. The show did not disappoint! 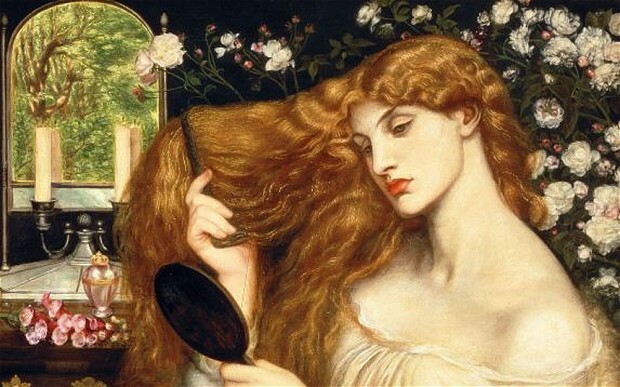 The exhibition had all the major works by Pre-Raphaelite painters such as Millias and Rossetti. It was incredible to be able to stand inches away from Ophelia and be able to study the brushstroke’s Millias’ hand made. It was moving how sincere the artists in the exhibition were—they were fully committed to the image and to the story each piece told. 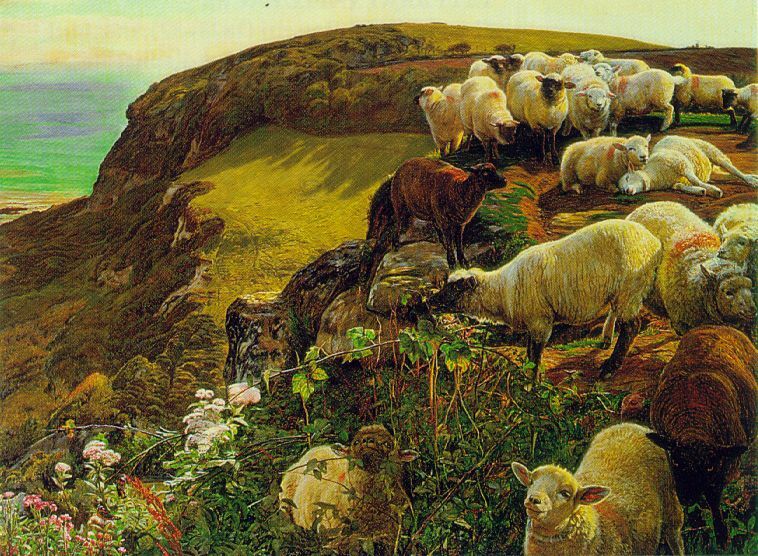 Even though the Pre-Raphaelites were out of fashion for a time, it’s my belief that sincerity and passion stand the test of time, and are beginning to be recognized again for their value. This summer also involved several photo shoots—I’m lucky enough to have some lovely friends and family who were willing to pose for me. 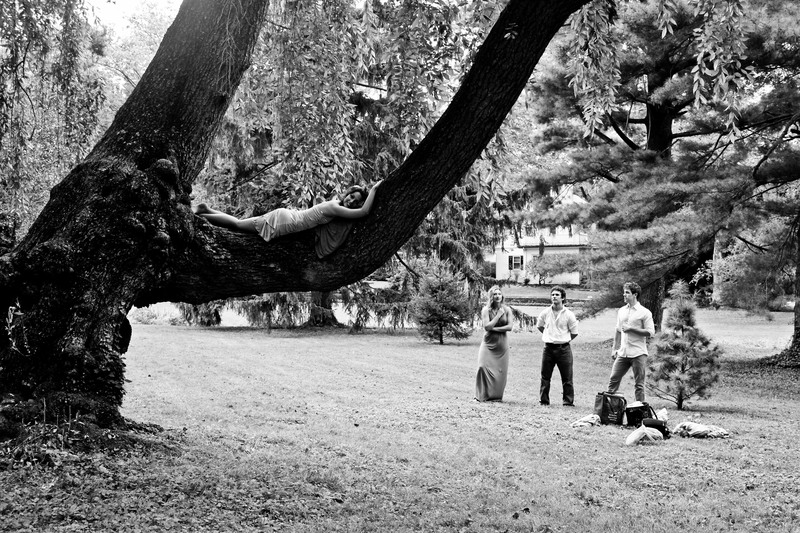 We did several photo shoots on beautiful summer days that involved some serious tree climbing, dress-up, and swimming. Thanks so much to my up-for-anything models Lauren, Tim, Courtney, Kelley, Adam and Todd! 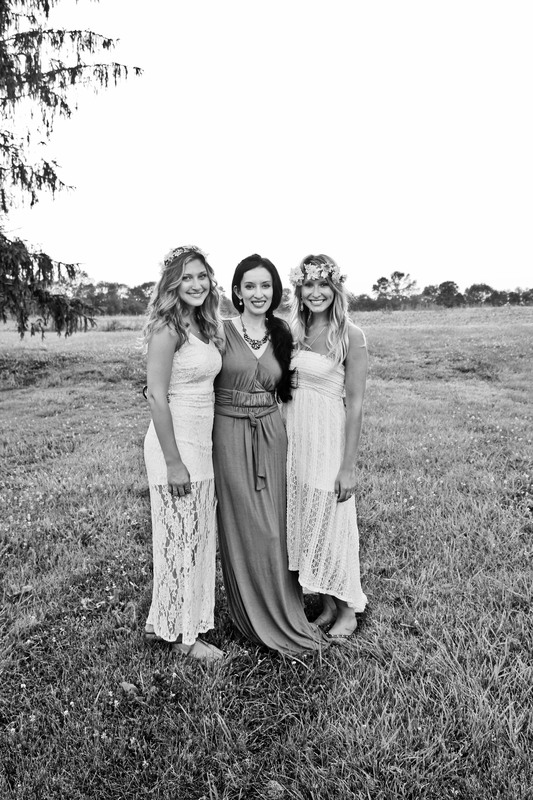 With my two beautiful models, Kelley and Lauren! 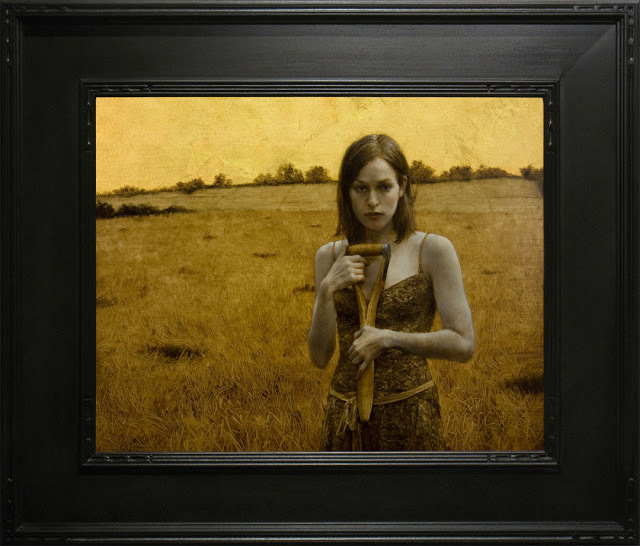 Another highlight was being able to study with the gilder and painter Brad Kunkle for the day in Brooklyn. I’ve admired Brad’s work ever since I saw it at Arcadia, and it was wonderful to be able to learn from a master gilder and painter such as him. His unapologetically beautiful images of figures infused with mythological, but obscure, situations resonate with something of my own vision. After studying with him, gilding with gold and silver leaf back in my own studio goes much more quickly and easily, after learning the correct process of applying it in conjunction with oil paint. 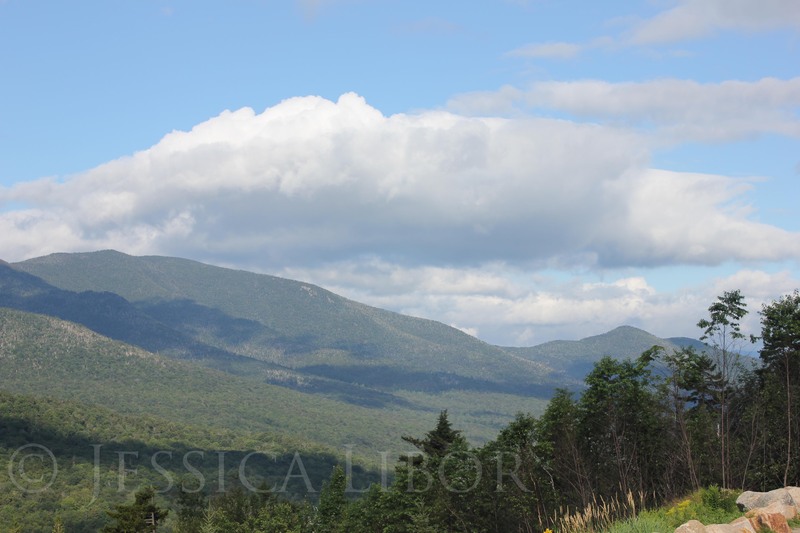 During the late summer, I made the day long drive up to New Hampshire to study with landscape painters associated with the Grand Central Academy, Lauren Sansaricq and Erik Koeppel. It was here in the White Mountains of New Hampshire that dozens of artists from all over the world gathered to learn from Lauren and Erik. I had never taken a landscape instruction course in my life, and thought it was time. 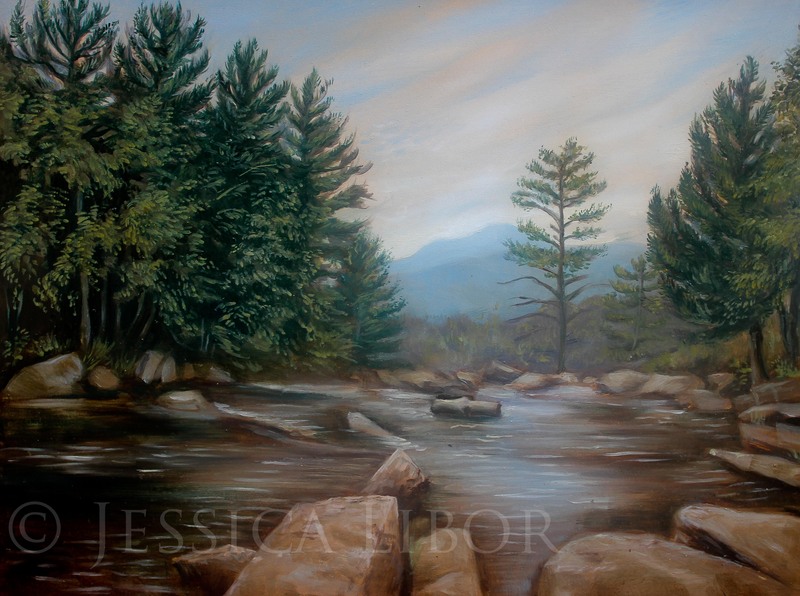 During the course of the week, our group painted in a different location outside each day, many of the locations the same ones that the Hudson River Valley artists painted in. 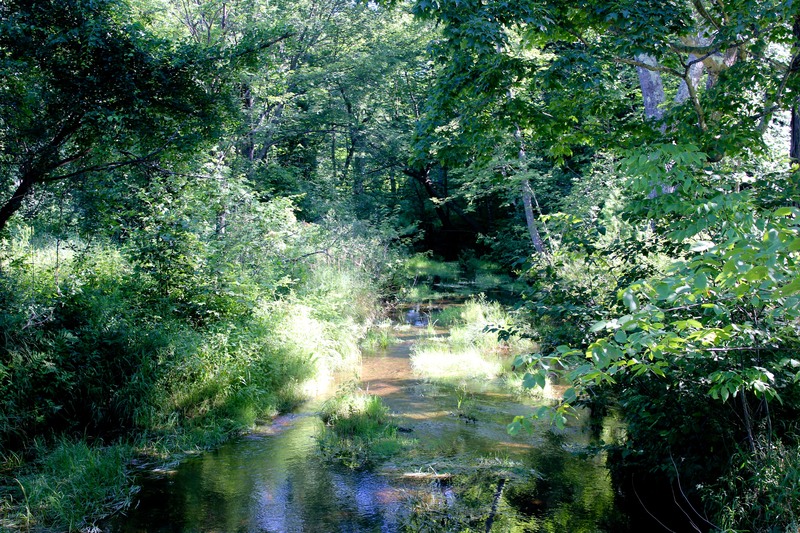 It was a welcome change to be able to spend the whole day out of doors, in the crystal clear air. 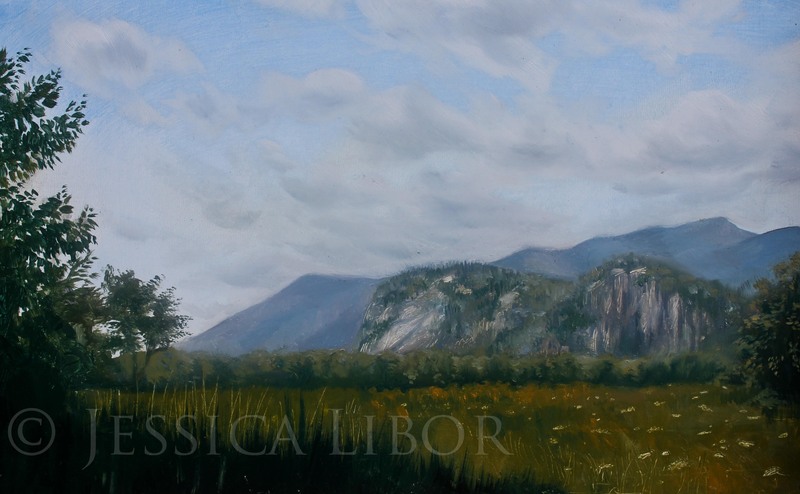 After the course, I felt like I wanted to re-paint any landscape I’ve ever done, now that I knew the tricks and principles of Hudson River Valley painters as practiced by Lauren and Erik. 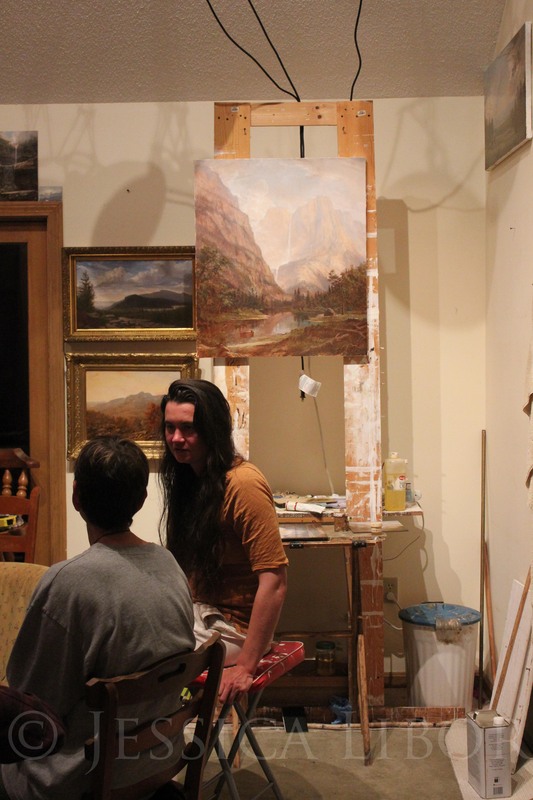 I was lucky enough to see Lauren and Erik’s studio as well, and see their latest works in progress from their recent trip to Yellowstone National Park. I love the way their atmospheres look so airy and detailed. 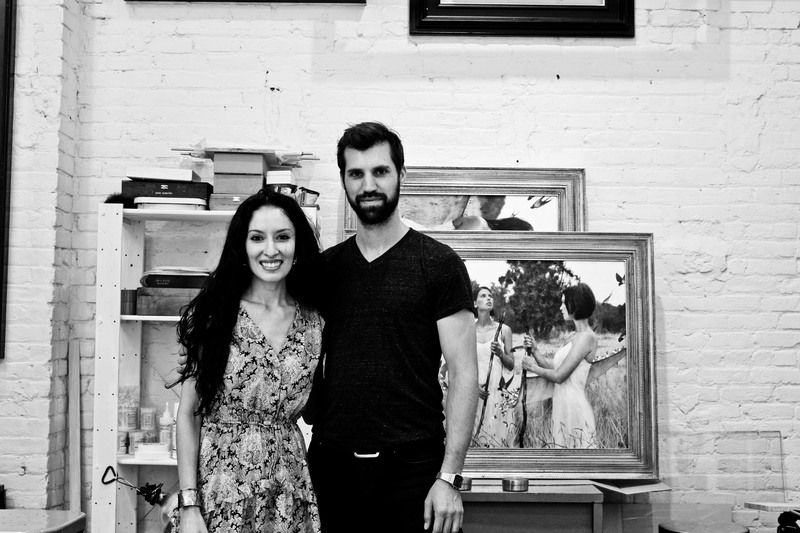 Many thanks to them for opening up their home and studio to those eager to learn. 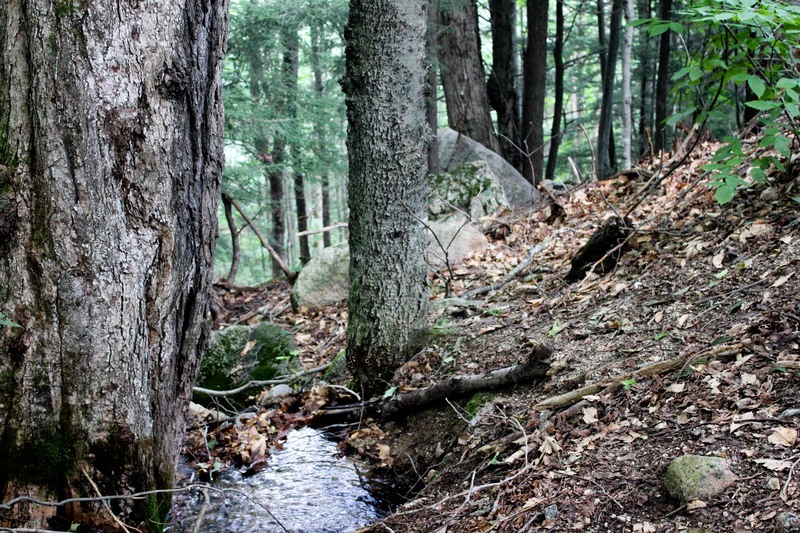 In the middle of painting on location…perched on some rocks in the middle of a stream! 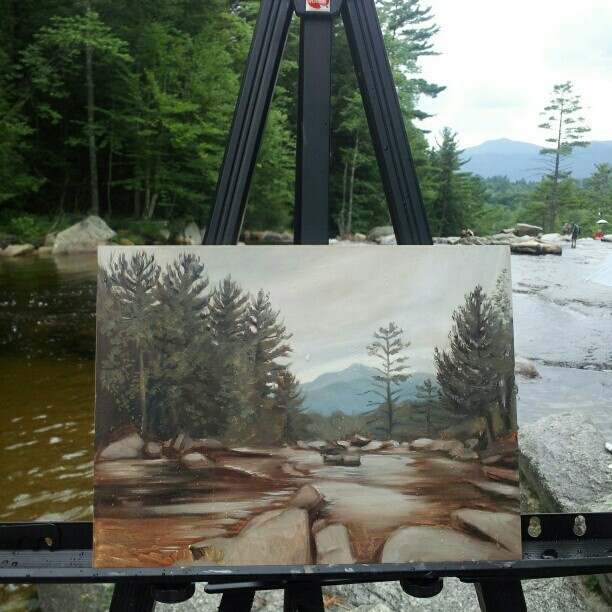 Below, some of the plein air paintings I was able to complete while in New Hampshire. 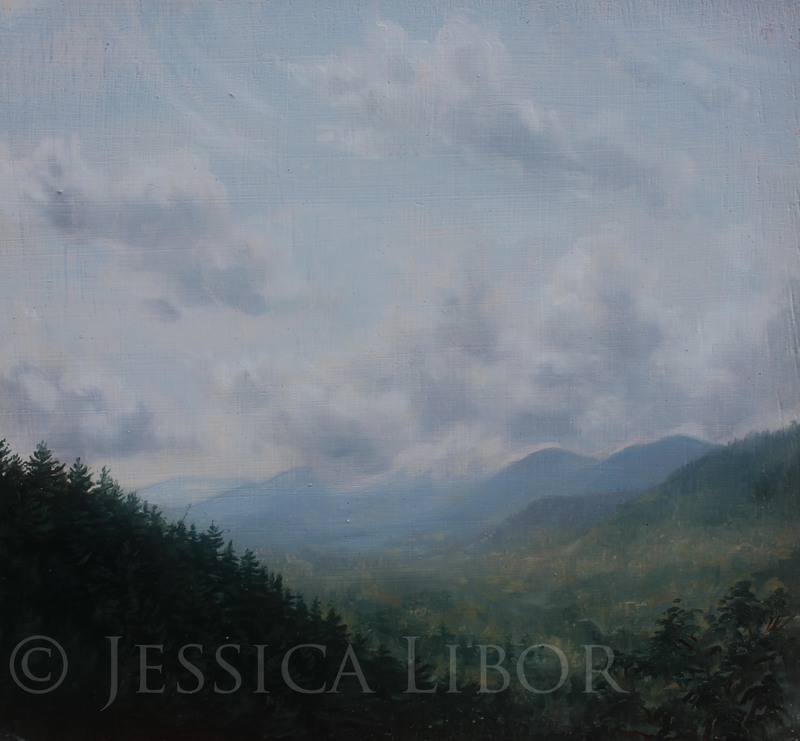 Please contact me at jlibor@jessicalibor.com if you’re interested in purchasing. 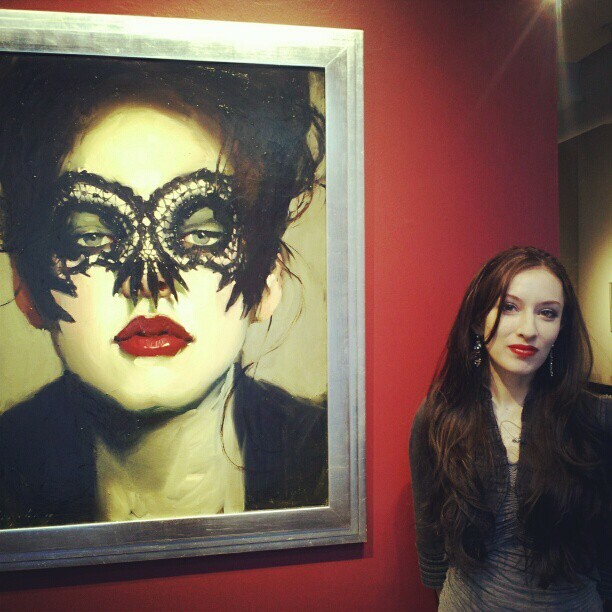 In August I was included in a group show at SOHO20 Gallery in Chelsea, NY. 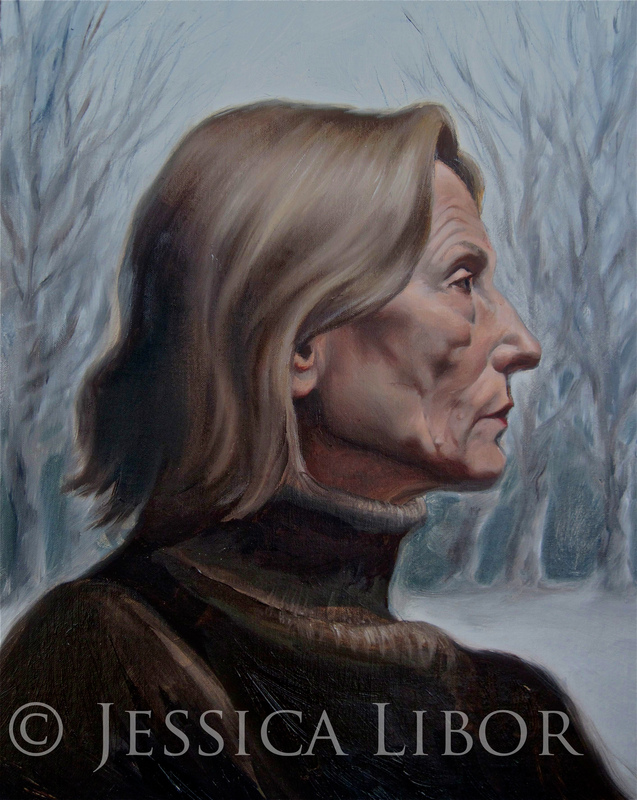 I exhibited my piece, Anna of the Woods. Another great trip was a visit to Newport, Rhode Island. This was such a fun trip, being a family vacation, so it was good to share explorations with my mom, dad, sister and her husband, and their crazy dog, Ollie. In between visiting the beach and exploring the town, we were able to hit up several museums and art galleries. Worth mentioning was the William Vareika Fine Art Gallery, right along Newport’s main street. 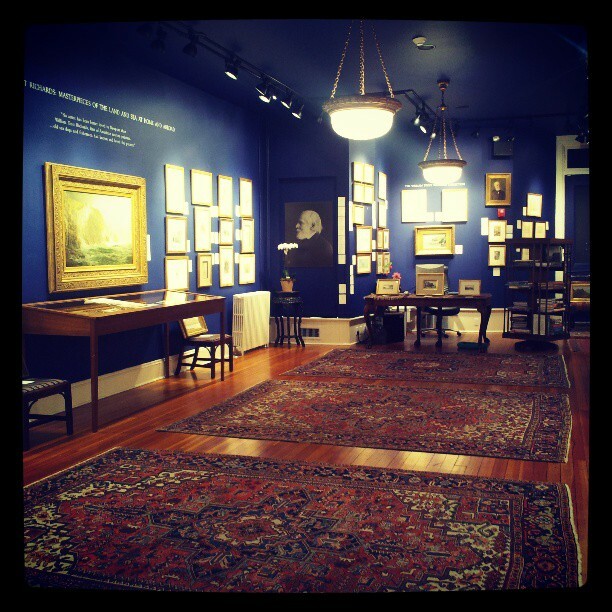 They specialize in 18th and 19th century art, and have a huge collection of William Trost Richard’s paintings and drawings. Definitely worth a visit if you’re in that part of town. Another fabulous museum is the National Museum of American Illustration, housed in a historical mansion close to downtown Newport. 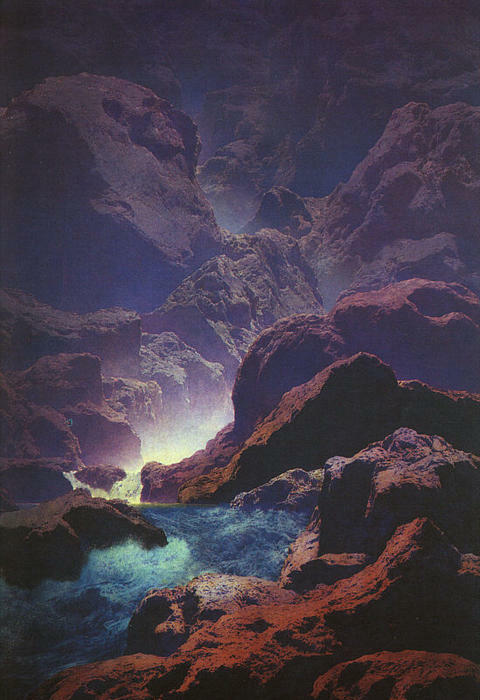 Here they house a large number of Maxfield Parrish’s illustrations and paintings, which look like glowing jewels inside the mansion. 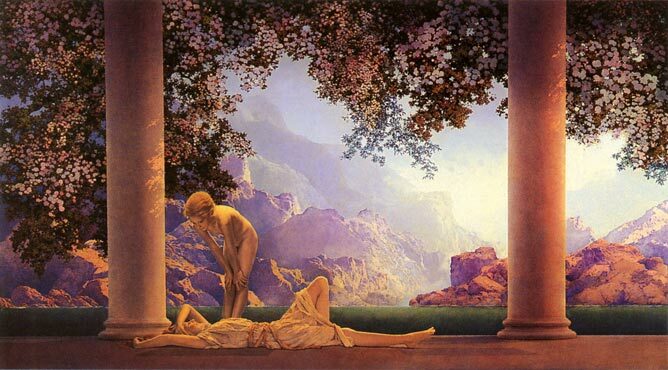 I’ve always admired Parrish’s work, so it was incredible to be able to study up close his paintings. Endless layers of glazes created his signature glowing effect. One thing that I really noticed about his work was the good design. 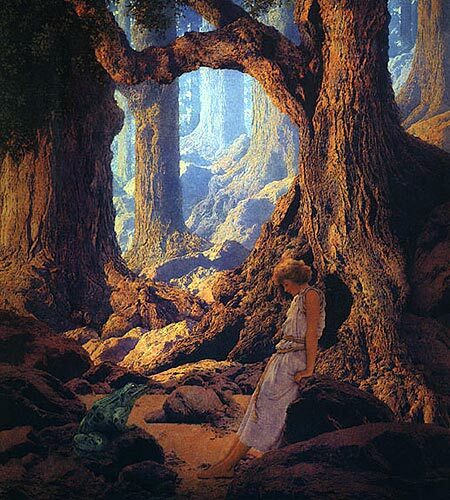 The way he used trees, figures and architecture to balance and create tension in his work. For all his planning, his work has a sense of a dream world or alternate reality, in the best sense. As far as my own work, I have planned out many of my paintings and transferred drawings to the boards that I work on. I have a clearer sense than before about the direction and feeling of my work. I’ve completed two paintings this summer, below. There are several more in my studio in different stages of gilding and painting. I’ll be teaching a Master Painting class at a local art center this fall, and am excited for my first opportunity to completely create a course curriculum. 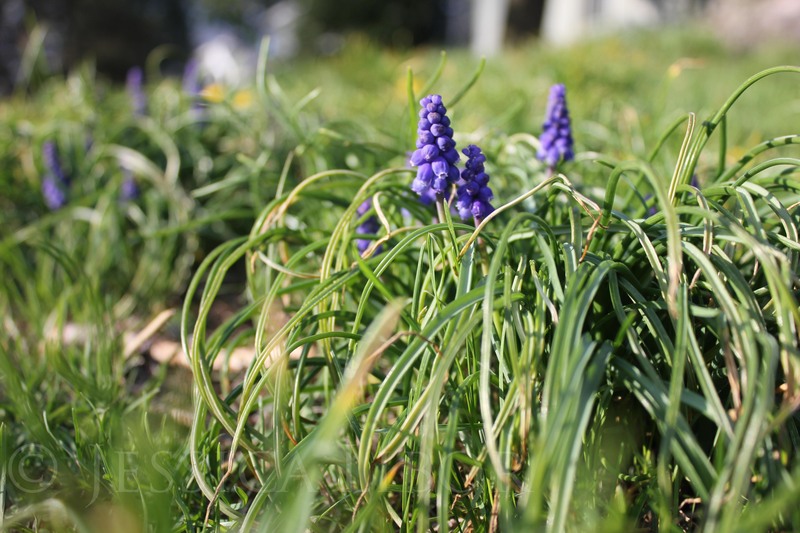 I have updated my website and blog. I’m ready to start school again—my last year in school as an MFA 2 student at Pennsylvania Academy of the Fine Arts. Excited to dive into this year and immerse myself in that atmosphere of creativity once again. I’ve also started a new project I am super excited about…I’ll be featuring different artists here on this blog, with in-depth interviews and photos that illuminate their process and thoughts that go into their work. 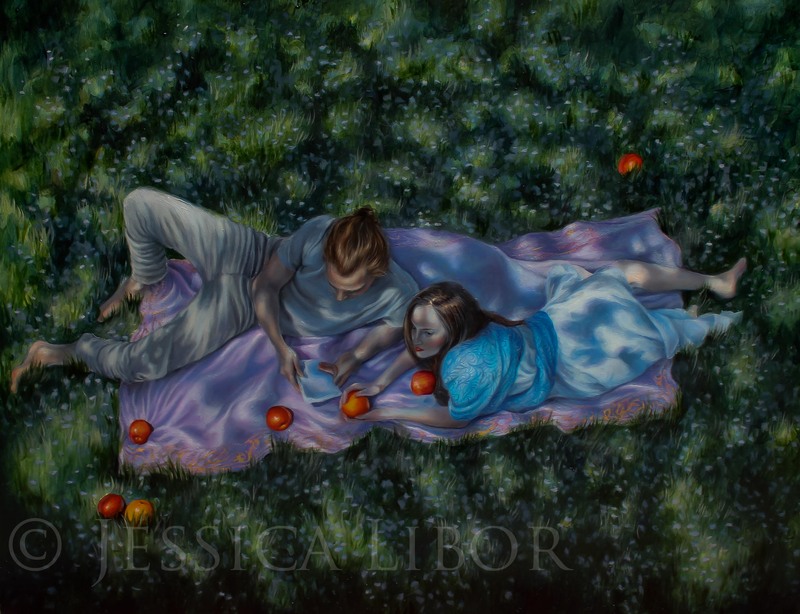 If you have suggestions for interesting contemporary artists, or are an artist interested in being featured, don’t hesitate to email me at jlibor@jessicalibor.com! 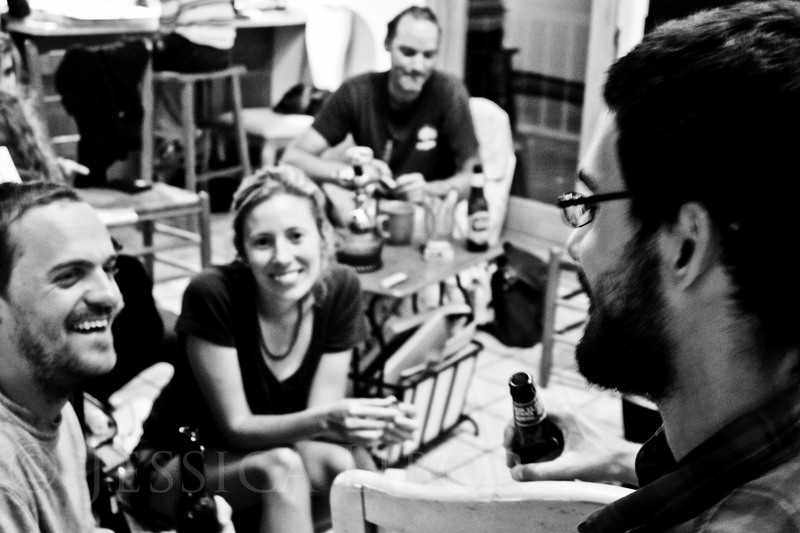 This project will be ongoing, fueled by a desire to help fellow artists from all career levels.